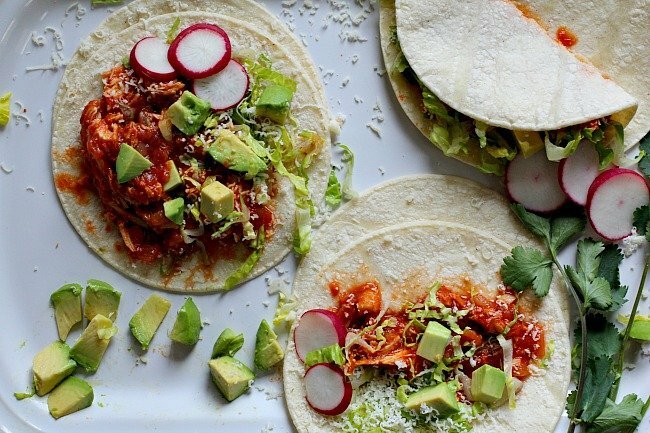 Looking for a unique chicken taco recipe? One that’s dripping in a luscious tomato based, taco seasoned, chile spiked sauce? This easy recipe for Mexican Chicken Tacos using shredded chicken breasts will shake up your Taco Tuesdays. 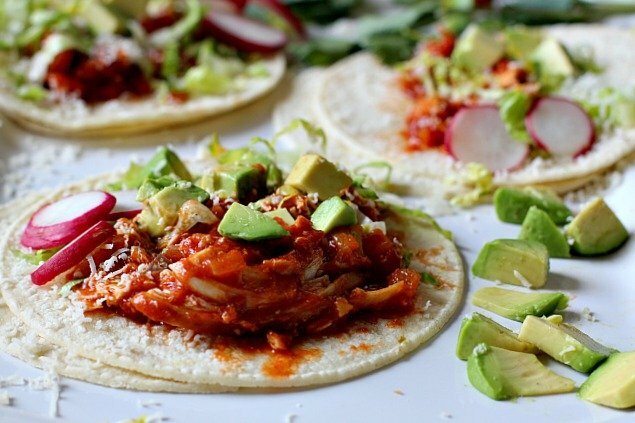 Give these Saucy Chicken Soft Tacos a try. I’m not sure if I’ve ever met a taco I didn’t like. And I really couldn’t estimate how long it’s been since we’ve been “taco people.” I suppose since I was a teenager, and that’s like a hundred years ago. I’d like to be on record that Taco Bell was not the inspiration, but rather it was a mom and pop restaurant in my home town when I was growing up. It introduced tacos and burritos to me long before that big corporate chain. Rick Bayless threw me over the edge with the introduction of official Mexican Street Tacos, warm soft corn tortillas filled with fresh ingredients far beyond the fried ground beef and chopped onions. It opened my eyes that a taco shell is a canvas for about any vegetable and protein combination that one can dream up. Take for instance these Swiss Chard Tacos = delicious. 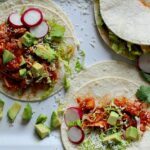 We don’t really need another reason to love chicken tacos, unless it’s this saucy chicken taco version, which is a little different than most main stream Mexican tacos recipes. This sauce, cooked stovetop is extremely easy and the seasoning for the chicken faster than any quick chicken marinade. 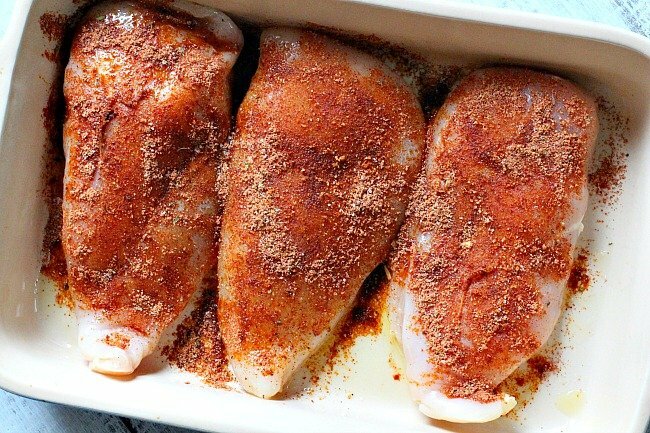 This recipe starts in the oven, by sprinkling flavorful homemade taco seasoning over boneless skinless chicken breasts and baking for thirty minutes. While the chicken is baking, the sauce is prepared stovetop and set aside. This easy taco sauce starts with a can of tomato sauce and is seasoned with garlic, onion, cumin and chile powder. Once the chicken is cooked and cool enough to shred, it’s added to the sauce and simmered for fifteen minutes. The tacos are built by warming the corn tortillas and filling them with the savory spicy chicken mixture. I’ve topped them with chopped avocado, sliced radishes, sliced romaine lettuce and grated Monterey Jack Cheese. We truly loved the crunch of the sliced radishes and creaminess of the avocado with tomato sauced chicken. It all came together for this flavorful and exciting soft taco recipe. Use Muenster cheese instead of Monterey Jack. Replace thin sliced Romaine with thin sliced green cabbage. Add very thin sliced rings of red onion, or Homemade Pickled Red Onions. Top with sliced green or ripe olives. Turn these tacos into tostadas. Fry your own or purchase store bought tostada shells. This recipe is a simple soft taco recipe and perfect for your next taco night. I hope you give this one a try and if you do, please come back and let me know how you liked it and give the recipe a star rating. Your feedback is valuable to me for developing future recipes. Coat chicken breasts with 1 tablespoon olive oil. Sprinkle with taco seasoning and bake at 350 degreed for 30 minutes, or until done. When chicken is cool enough, shred chicken with fork. In a sauce pan, cook onions in remaining olive oil until tender. Add chicken and tomato sauce and remaining seasonings and simmer on medium low, covered for 15 minutes. Warm tortillas. To build tacos, scoop a spoonful of chicken into each tortilla. Add lettuce, cheese, olives and then avocado. Thank you for sharing this recipe. I would love to try this as it is my first time to make one with avocado. You definitely need more soft tacos in your life. I hope you give this recipe a try.